PMC Home. 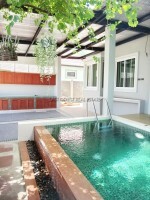 This 3 bedroom house is located in a gated housing village on Soi Crocodile Farm in East Pattaya. Conveniently located to the By Pass, International schools, shops, markets and many other local amenities. Pattaya City is only a short drive away. Sat on a 100 sq. wah plot of land the house consists of 3 bedrooms and 2 bathrooms. The home has high ceilings and most rooms has large windows allowing for nature light to come through. The living area has an open plan design and comes with a fitted European kitchen. There is a large garden situated to the front of the property which can fit a good size swimming pool if one wish to. The home has covered patio and car park. The village has 24 hour security, communal swimming pool, children's playground, and fitness. It is available for sale fully furnished with title deed held under Thai name and transfer fees split 50/50 between both parties.